We have developed fast methods for reducing the dimensionality of spectral data, such as IR spectroscopy data, chromatography data, etc. In contrast to the widely known methods for projection of data with dimensionality N read counts onto spaces of lower dimensionality, having computational complexity of order N × N, proportional to the dimensionality of the covariance matrices for the data, in order to reduce the computational time we propose using new methods that can be realized in a sliding window over n read counts. 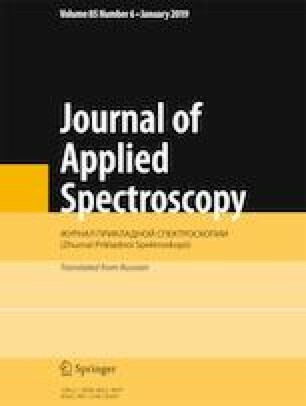 As a result, the fast methods have computational complexity of order n × N. We present the results of computer experiments on reducing the dimensionality of IR spectra for automotive gasolines. The problem of reducing the dimensionality of IR spectra is important for both their graphical visualization and decreasing the multicollinearity and reducing the influence of noise in simulating behavior or analysis of parameters depending on the spectral characteristics. Translated from Zhurnal Prikladnoi Spektroskopii, Vol. 86, No. 1, pp. 116–121, January–February, 2019.